Avoiding the European winter, I embarked from Sicily to Africa, this time Tunisia was the country which woke up my curiosity and I didn’t doubt to visit it. From the port to Tunis, the capital city is about 15 km, but I arrived there at 11pm so I couldn’t look for a reasonable hotel and I stayed in the first one that I found. But what a difficult is to arrive to Africa from Europe, I hardly remembered it; the Africans are very dirty. It doesn’t matter if they are black or Arab, both argue the first position to the dirt. Few days later my brother Alejandro arrived from Spain, to cycle with me for a couple of months. For this reason through some contacts we contacted some companies to introduce the project and we were successful because we were very well received. This time the sponsors were an Optic shop which his owner had been living in Belgium and a clothes brand, which gave us some clothes for the winter. 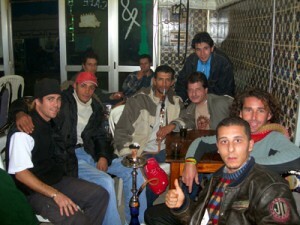 We stayed in Tunis during three weeks, in those we became friends, like Yaya and Joseph with whom we often played soccer or shared a tea and a sisha, the water pipe. We also met Mario and his friend Giovanni, who showed us the other side of the capital city at night. And I surprised myself because I thought that the Muslim laws also here prohibited the alcohol; but as in everyplace… if you know where to go, with a swollen wallet everything is possible. And that way to squander happiness had some people after a couple of drinks. Talking with Giovanni I understood as the religion influences on the law and on the Muslim customs. He told me that a tourist cannot go to a room of a hotel with a Tunisian girl. If they are not married, the risk is very high; somebody can call the police and the guy could be arrested. I also knew about the anecdote of a Cuban doctor, in Algeria, who was visited by a couple with plans of contracting marriage and their respective families; everybody wanted to check the future wife’s virginity. But when the Cuban noticed that the girl was not virgin, he consulted to his superiors before giving the bad news to the families, but he was ordered to say the truth. And although it seems lie, the girl’s family felt offended and they sprayed her with kerosene and they set fire to her. Stories like this surprised me and showed me how in many cases the tradition is above everything. According to other commentaries mothers-in-laws that look for the dirty sheets of blood of the night of weddings still exist. The last days in Tunis I went many times to the Consulate of Libya, where I requested the visa to follow trip heading for Middle East. 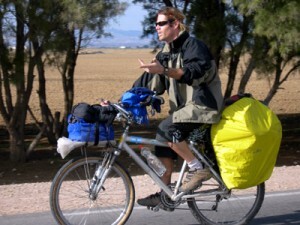 I also introduced letters in French and in Arabic languages which explain the project of travelling the world by bicycle. But this time seems that the project played against me, because to the North American girl who requested the visa before me got it, but I always had to wait. 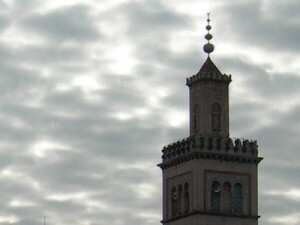 Libya like many African countries has a president who rules from decades and according to commentaries its population as so many Muslim countries are pent-up, because they cannot talk anything about politics or religion. 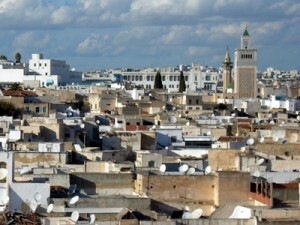 Finally after 5 weeks more which I travelled Tunisia, I desisted of the idea of going to Libya. Because his Consul in Tunis, who surely also has a mental limitation, always opted to don’t answer me; because seemingly for him the diplomacy is exactly that; do not answer. 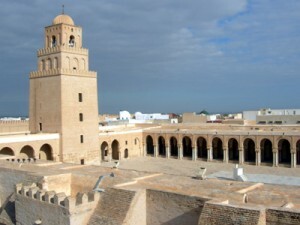 Kairouan is the fourth older Muslim city in the Arab world; it possesses 185 mosques and for this reason a high number of visitors. We were happy to arriving there, it was the first goal that we concluded together, where we could eat and to sleep better, although we could not take a shower, the water was icy. In route again, we usually camped although it was not the initial idea, but the small populations that we crossed didn’t have hotels, then our tents starting to be the only option. I still remember the night of December 24, it was so cold and I almost freeze; that night Ale presented me a traditional Argentinean milk sweet and he also cooked some pancakes. Obviously it was an atypical Christmas Eve and we enjoy it. On Christmas, the day was harder, because we started to cycle very late. 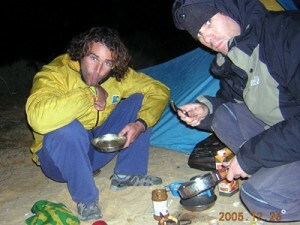 We crossed a salt lake at night through an empty route and then we camped around. Only in the morning when we woke up, we were aware of the place where we slept. It was in the middle of the desert!!! 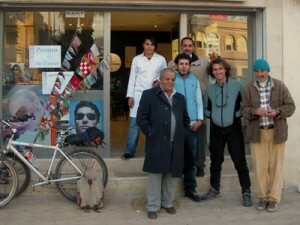 In the Tunisian Sahara, where the temperature surely at night was below zero. Generally we slept wearing three our four trousers, with many socks and with so many overcoats as we had, anyway in more than an occasion I was not able to reconcile the dream. Finally after other four days of travelling, we arrived to Douz, a tourist place from where excursions leave toward the desert. 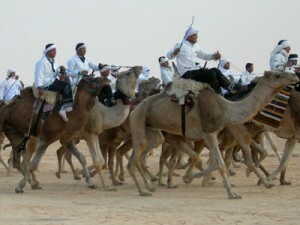 And at that time its people celebrated its biggest festivals, where different events existed, like camel’s fights and careers, typical Bedouin dances and caravans procession. It was worthwhile to arrive on time to know one of the most important festivals in the north of Africa. Then we also left to a desert tour; by camel and with ours bicycles.